OneMain has around 1,700 local branches in 44 states and provides personal loans to borrowers with good or bad credit. You have several convenient ways of contacting OneMain to take out a loan, including filling out a short application online, by phone, or at a local branch. OneMain Financial, formerly known as CitiFinancial, was founded in 1912. In 2015 they combined with Springleaf Financial and rebranded as OneMain Financial. OneMainFinancial is one of the leading providers in personal loans and have funded over $120 billion to more than 10 million consumers. To apply, you can contact one of the OneMain branches in 44 states in person, online, or by phone. If you apply online, the form is sent to a OneMain branch in your location and a loan specialist will get in touch with you to discuss your options. To qualify, you must be a US citizen or permanent resident. OneMain looks at your credit score by performing a soft credit pull, which does not affect your credit score. Those with good credit scores are eligible for the lowest rates and best terms. You must provide proof of your identification and income, recent bank statements, recent pay stubs, W-2, tax returns (two years for those who are self-employed), and a utility bill. If you are pre-approved for a loan, a loan specialist contacts you and discusses your options with you by setting up an appointment at a branch. OneMain offers unsecured personal loans which allow you to have fixed rates and secured loans which require you to put up collateral. A little less than half of OneMain’s clients use secured loans, which allow you to have a lower interest rates and better terms. When you accept the terms, these loans are available anywhere from the same day to the next business day. OneMain has flexible payment options, allowing you to pay online, over the phone, or at any of their branches. You can also choose your own due date for payments. An added benefit for OneMain borrowers is that they have free access to their credit scores. OneMain Financial has branches in 44/50 states: Alaska, Arizona, California, Colorado, Delaware, Florida, Georgia, Hawaii, Idaho, Illinois, Indiana, Iowa, Kansas, Kentucky, Louisiana, Maryland, Maine, Michigan, Minnesota, Mississippi, Missouri, Montana, Nebraska, Nevada, New Hampshire, New Jersey, New Mexico, New York, North Carolina, North Dakota, Ohio, Oklahoma, Oregon, Pennsylvania, South Carolina, South Dakota, Tennessee, Texas, Utah, Virginia, Washington, Wisconsin, West Virginia, and Wyoming. Multiple Loan Types: OneMain offers secured personal loans, unsecured personal loans, and auto loans. Receive Funds With Your Preferred Method: Personal loans may be provided by check, Automated Clearing House (ACH) deposit, or a prepaid card. Receive Cash Quickly: You can receive your funds the next business day. Nationwide Service: There are around 1,700 branches of OneMain across the nation, meaning that there is most likely a location near you. Multiple Application Methods: OneMain allows their customers to apply online, over the phone, or in person. The maximum personal loan amount caps off at $25,000, which is lower than many of their competitors. However, those who take out an auto loan may be eligible for a higher amount. OneMain only has branches in 44 states, so customers in states that do not have local branches may have trouble acquiring funds. Interest rates are higher than those offered by peer-to-peer (P2P) lenders and traditional banks. OneMain’s APR for personal loans ranges from 17.59% - 35.99%. For a secured loan, there is a minimum interest rate of 9.99%. Although OneMain has no minimum credit score or income, borrowers' average scores are between 600 and 650. Personal loan amounts range from $1,500 - $25,000. Loan terms range from 1 to 5 years. The origination fee varies by state and can range from 1% - 5%. There are no prepayment fees. Late fees, if there are any, vary by state. 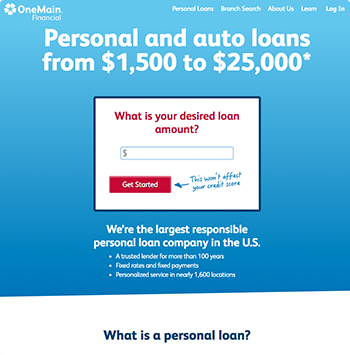 How does OneMain compare to other lenders? Unlike many of their competitors, OneMain accepts applications from borrowers with good and bad credit scores either by phone, online, or in person, so if you prefer a traditional bank experience or applying easily online, this is an option for you. How do I know if I qualify for OneMain? Individuals who are eligible for OneMain must be a US citizen or permanent resident, over 18 years of age, and live in one of the 44 eligible states: Alaska, Arizona, California, Colorado, Delaware, Florida, Georgia, Hawaii, Idaho, Illinois, Indiana, Iowa, Kansas, Kentucky, Louisiana, Maryland, Maine, Michigan, Minnesota, Mississippi, Missouri, Montana, Nebraska, Nevada, New Hampshire, New Jersey, New Mexico, New York, North Carolina, North Dakota, Ohio, Oklahoma, Oregon, Pennsylvania, South Carolina, South Dakota, Tennessee, Texas, Utah, Virginia, Washington, Wisconsin, West Virginia, and Wyoming. Those who are interested can submit an application with basic personal and financial information to see if they are pre-approved by OneMain.